Last December, we announced our partnership with Golden Frog to provide free Dump Truck secure online storage to every Giganews member. When we made Dump Truck available to Giganews members last year, the service included WebDAV access to your files and a basic Web App. Over the past year, Golden Frog listened to your comments and worked hard to improve the service based on your feedback. Today, Dump Truck online storage gets even better with completely new Desktop apps, Mobile apps and rebuilt Web App so you can use Dump Truck on all of your devices. Don’t forget to use your Giganews username and password to access the Dump Truck Desktop apps, Mobile apps and Web App. 30 GB of Dump Truck is included free with every Diamond account and 5 GB of Dump Truck is included free with all other Giganews accounts. Why use Dump Truck online storage? It’s simple - you should choose Dump Truck for your storage needs because Golden Frog is more focused on security than other online storage providers. Golden Frog was founded to keep the Internet free and open while respecting user privacy and security. In 2009, Golden Frog launched VyprVPN Personal VPN to protect users' Internet connections and Dump Truck is their latest service focused on privacy and security. Why is Dump Truck more secure? When you upload your files to Dump Truck, Golden Frog the only company who handles your data so your privacy is protected and your security is ensured. Golden Frog doesn’t rely on 3rd parties to store your files. Similar to how Giganews operates its own Usenet clusters, Golden Frog owns the hard drives, servers and manages their own global network so they can keep your files secure. They also store three copies of your files using 256-bit AES encryption to ensure you always have a secure and redundant copy. When you upload or download files from Dump Truck all data is encrypted using 256-bit SSL - the same encryption level used by financial institutions. Golden Frog also doesn’t use data deduplication to inspect your files to save on storage costs, nor will they ever display ads or analyze users’ files for marketing purposes. Like Giganews, Golden Frog respects users’ privacy and security and will never inspect your files. Use Dump Truck Desktop on Windows or Mac to securely sync and store all of your files. The Dump Truck Web App has been totally redesigned and rebuilt with improved performance and new features. 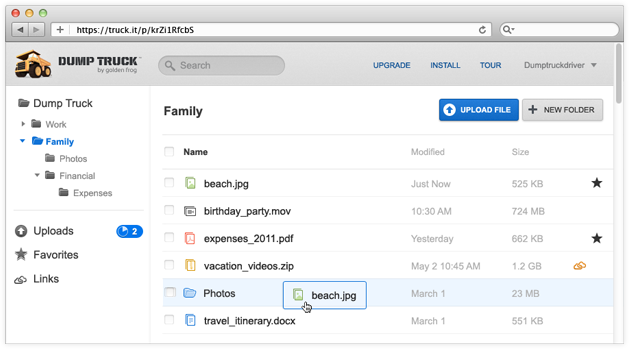 Use the the Web App to access, upload and share your files from any web browser. 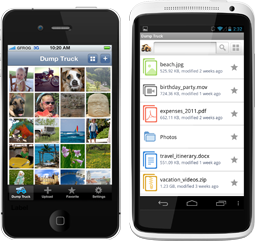 Dump Truck Mobile App to access and store files while on the go. Available on Google Play and the App Store (pending App Store approval). Access Dump Truck with your Giganews username and password and see all of Dump Truck’s new features for yourself! If you are not currently a Giganews member, sign up now for free 14 day free trial to try Dump Truck and much more.